This post contains affiliate links which means I may receive a commission if you click these links and purchase something that I have recommended. 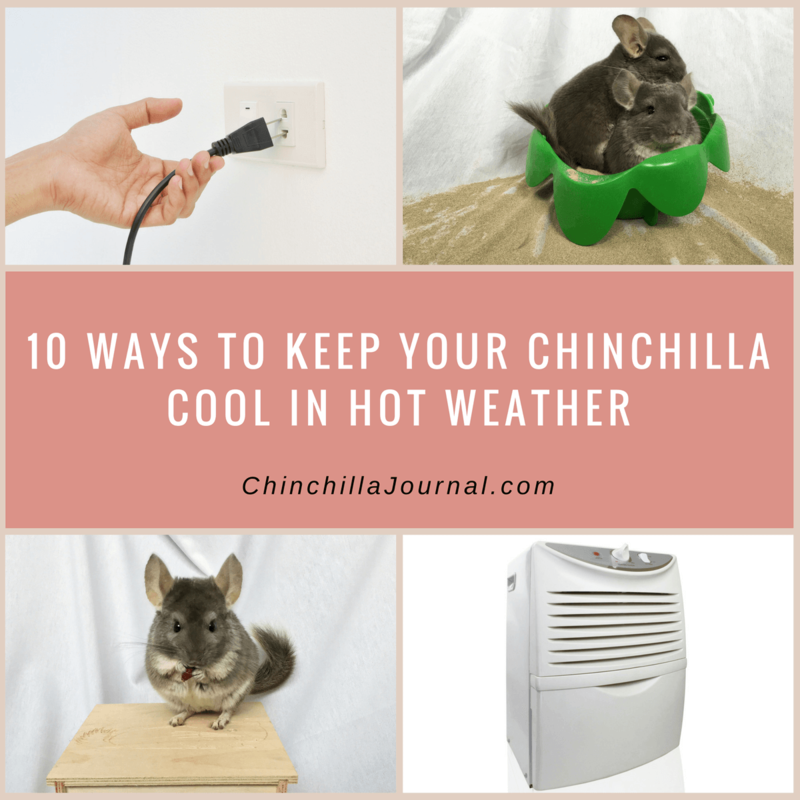 If you live somewhere that gets hot or humid at any time of the year, you need to make sure your chinchilla doesn't overheat. Chinchillas don’t have sweat glands, so if the temperature or humidity get too high, they can’t cool themselves down and become very susceptible to heatstroke and other heat related problems. Fortunately, even if the temperature is soaring outside, there are lots of things you can do to keep your furry friend safe and cool. 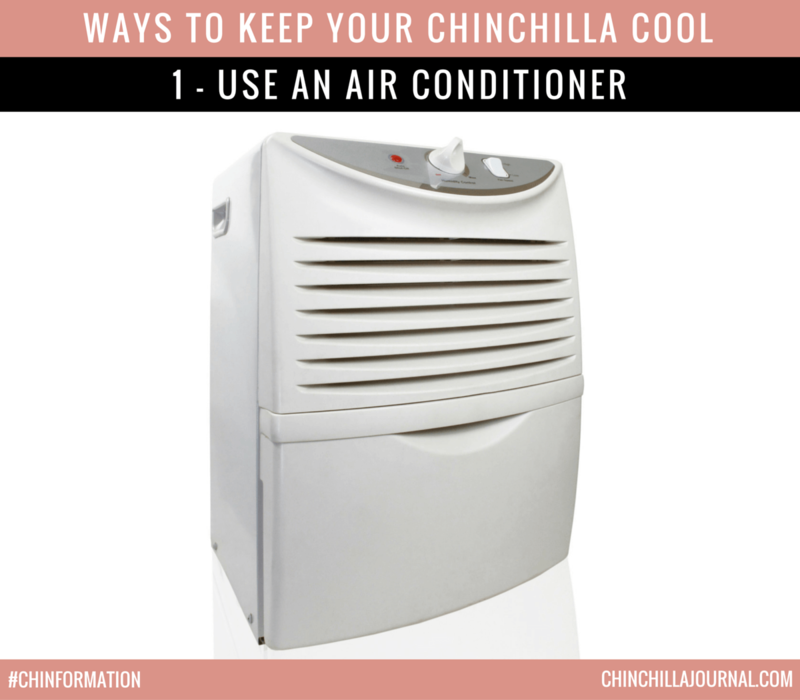 An air conditioner is the best way to keep your chinchilla cool when it gets hot and is an essential item if you live somewhere where the temperature goes above 75°F (24°C). The easiest way to keep the temperature of the room in the ideal range for your little fluffball is to buy an AC unit with a built in thermostat. A programmable timer is another useful feature to look out for when buying an air conditioner if the room only needs cooling for a few hours each day. 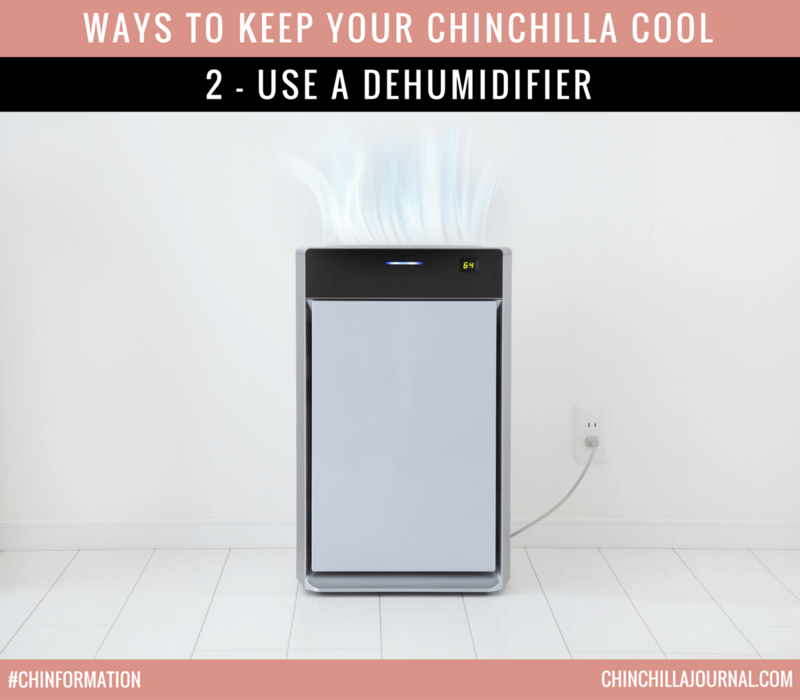 If you live somewhere where the humidity levels normally go above 50%, you may also need to buy a dehumidifier to keep your chinchilla comfortable. Most air conditioning units do have some dehumidification capabilities but if you live in an area with very high humidity, you’ll probably need to buy a separate dehumidifier too. 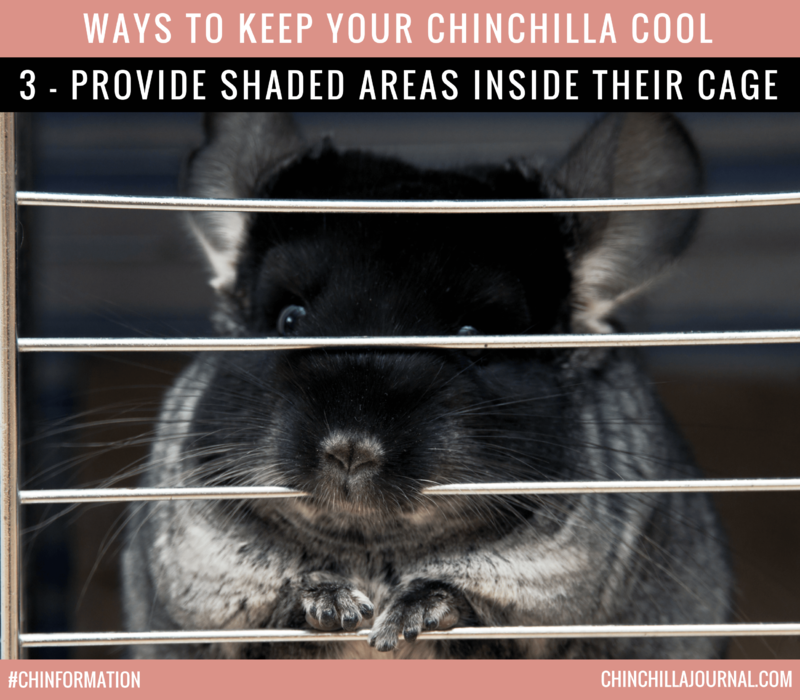 Even with an air conditioner and dehumidifier running in the room, your chinchilla will still appreciate having shaded areas inside their cage during the hotter times of the year. Dark, shaded areas don't heat up as quickly as other parts of the cage and give your little fur baby a cool spot where they can chill, sleep and escape the heat. To add some shaded areas to your chinchilla's cage, get them a wooden hideout with a small opening that doesn't let in much light or hang hammocks on one side of the cage to create a dark, shaded spot for them. Electrical equipment emits a lot of heat and can cause the temperature of the room your chinchilla lives in to rise. 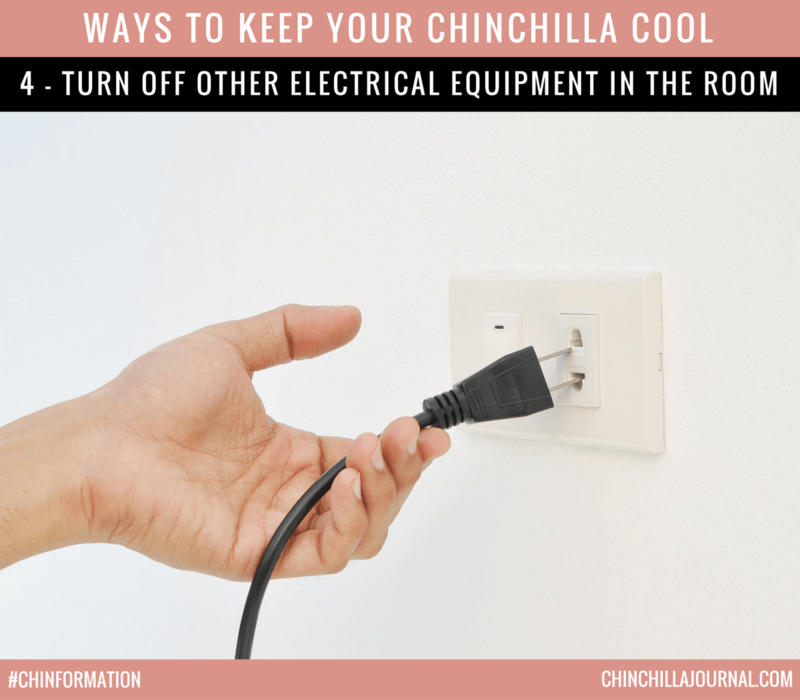 Ideally, the only pieces of electrical equipment you should have turned on in your chinchilla’s room are the air conditioner and the dehumidifier. If you have other active electronic devices in this room, move them to a different room or only use them when absolutely necessary to keep the temperature under control. Direct sunlight can cause your chinchilla to overheat very quickly, even if the average temperature in the room is below 75°F (24°C). 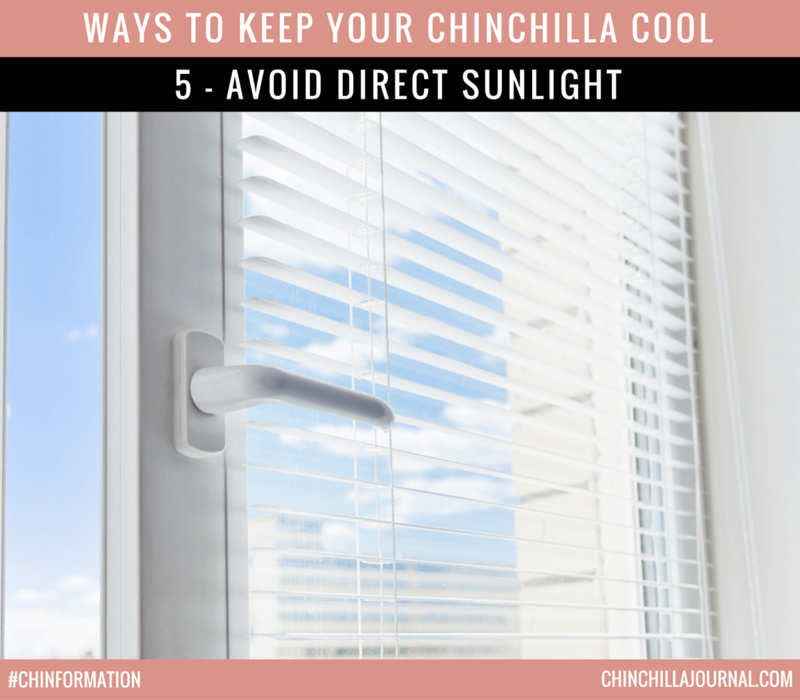 To avoid direct sunlight, make sure your chinchilla’s cage is placed in a shaded area of the room and away from any windows. 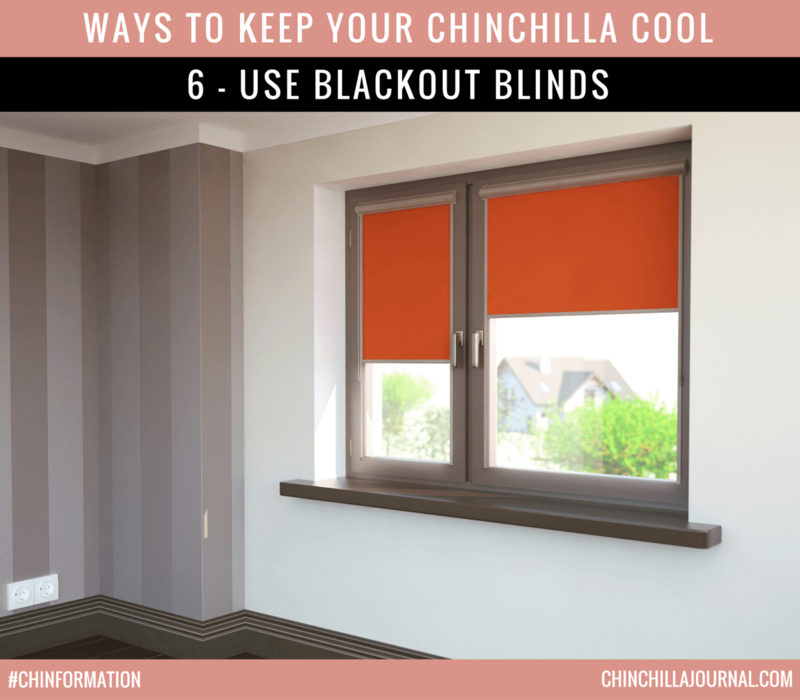 Blackout blinds block out the warming rays of the sun and are a great way to stop your chinchilla’s room getting too hot. They can also be beneficial in winter if you live in an area where the temperature dips below 60°F (15.5°C) because they help keep the heat in the room during the colder times of the year. Chinchillas can’t sweat and so heat up very quickly when they’re physically active. 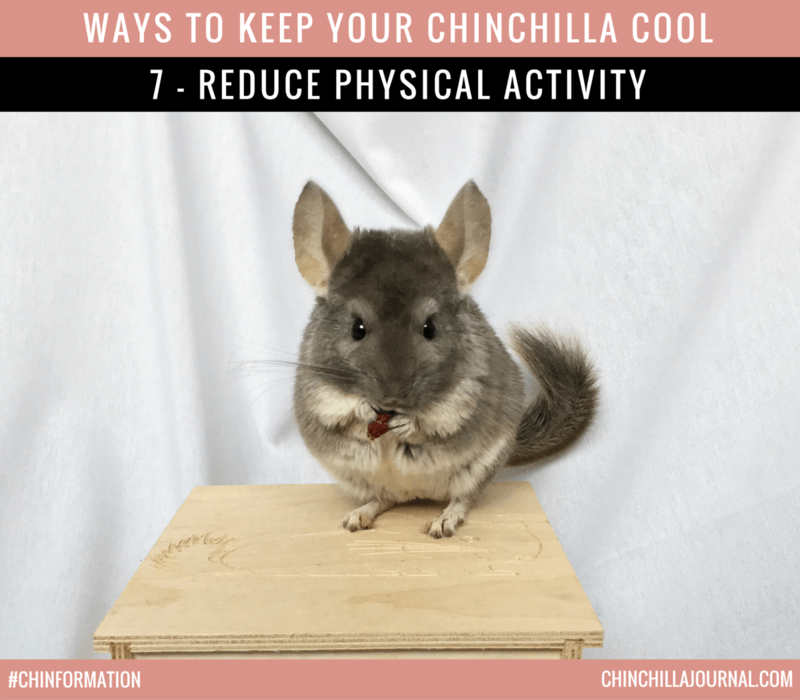 This isn’t usually a problem during the cooler times of the year but when the temperature starts to rise, too much physical activity can lead to your chinchilla overheating. To protect your little fluffball from overheating, it’s best to keep their physical activity to a minimum during the hotter times of the year. This means reducing or stopping any exercise outside of their cage and removing any exercise wheels from their cage when the temperature is above 75°F (24°C). The grease that builds up in your chinchilla’s fur between dust baths can contribute to overheating during the hotter times of the year. Dusting your chinchilla daily or every two days will keep their fur clean and help them stay cool when the temperature increases. When changing your chinchilla’s dusting routine, make sure you check their skin for any rough patches. Excessive dusting can dry out their skin out, so if you notice any rough patches, stop the dust baths for a couple of days and then give them shorter dust baths when you resume the dusting schedule. During the hotter times of the year, your chinchilla is likely to drink more water because it helps them stay cool. This means you need to be checking their water more frequently when the temperature increases and make sure they always have plenty of water available. 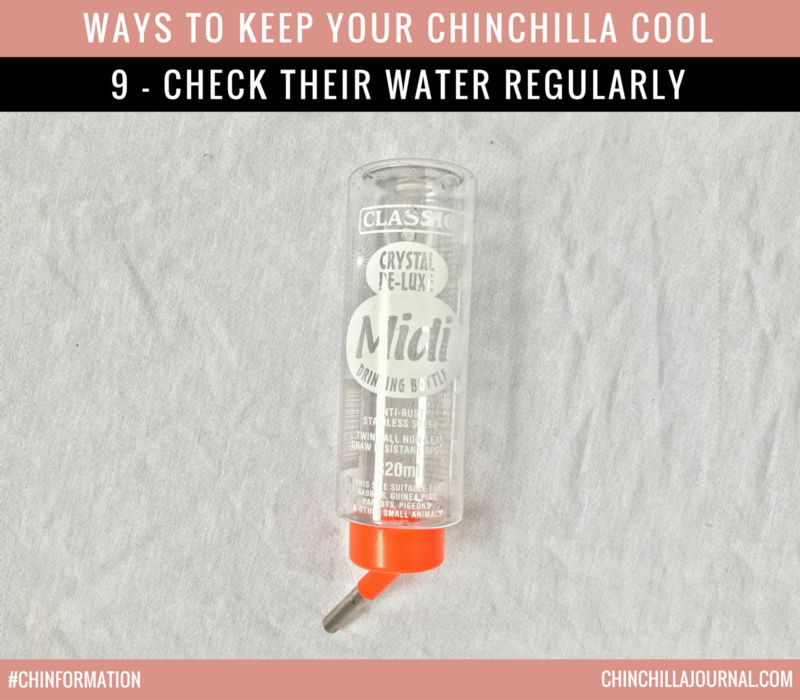 You may also want to consider buying a larger water bottle for your chinchilla which you can use when the temperature rises above 75°F (24°C). This will make it much easier for you to keep your little fluffball hydrated when it gets hot. 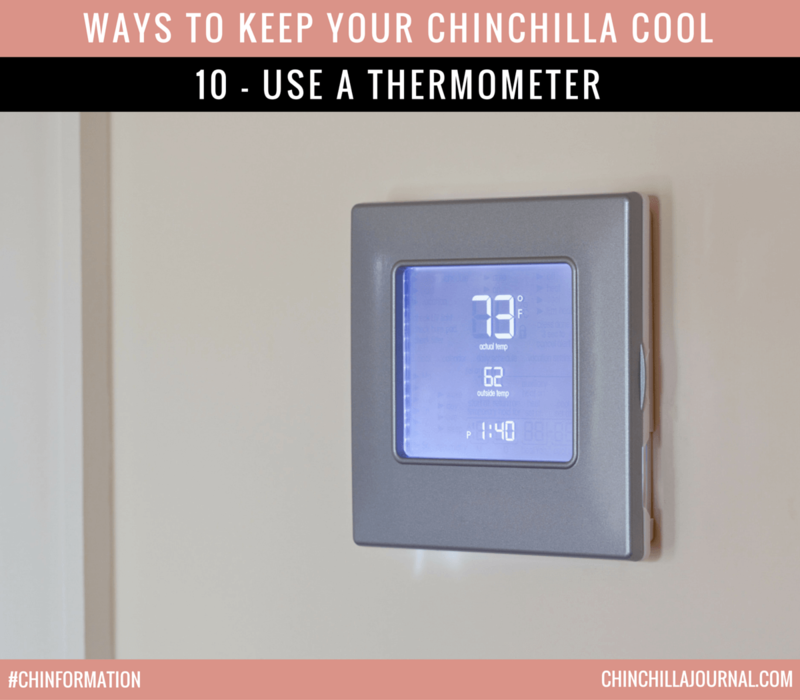 A thermometer will tell you when your chinchilla’s room is getting too hot and when you need to start taking action to cool down the room. Keep the thermometer in your chinchilla’s room all year round, check it daily and whenever the temperature goes above 75°F (24°C), implement all the steps above to keep your furry friend cool. Do you have any additional tips for keeping your cool? Do you live somewhere where the temperature goes above 75°F (24°C)? Let me know by leaving a comment. HI toM. I have a cover for their waTer bottle which not only keeps their water nice and cool, but has stopped them pOking their Noses tHru the cage and chewing holes in the bottle! Great suggestion Debbie. Which water bottle cover do you use? Does it work on all sized water bottles? Hi! I live in Arizona and its really hot outside, like all the time. My parents won’t let me turn the tempEture down to 75 and its at 78 all day. Is that Okay? Hi. It depends on the temperature of the room where your chinchilla lives. Sometimes it can be a lower temperature inside than outside, so the room could still be 75 or lower. The temperature of the room where your chinchillas live needs to be 75 at the most. If it’s over 75, I’d let your parents know that it’s dangerous for your chinchilla to be in a room that hot and ask them to let you turn the temperature down in that room for their safety. Hi, i live in hawaii where fhe temper rarely gets down to 75 degrees. We got our chinchilla a cooling Stone, but she doesnt really sit on it. My parents are trying to be eco friendly so Dont want to inVest in a dehumifiER or ac. I dont know what To do to cool my chinchilla down. Any suggestions? I’d measure the temperature of all the rooms inside your home with a thermometer and see if any of those go below 75 degrees. Even if it’s above 75 degrees outside, it may be cooler in certain rooms inside your house. Once you’ve found the coolest room, I’d move your chinchilla there and then implement the other tips in this post (get blackout blinds for the room, keep their cage out of direct sunlight etc). What’s the average temperature inside the coolest room in your home? Yes. That’s a great idea. HI MIA, I USUALLY DO ONE “HACK” THAT NORMALY REDUCES THE TEMPERATURE FROM 40ºC TO 23ºC (I LIVE IN PORTUGAL, SO IT´S NORMAL IN THE SUMMER THE TEMPERATURE GOES ABOVE 40ºC), IT´S VERY SIMPLE, AND DON´T PUT OUR CHINCHILLAS IN DANGER: USE PLASTIC BOTTLES WITH WATER AND PUT THEM ON THE cold storage. USE AN ELETRIC FAN AND PUT THE BOTTLES IN FRONT OF HIM with some distance, AND THE SAME distance From THE BOTTLES TO THE CAGE. IT WILL WORK LIKE AN “ECO AC”. I UsuALLY DO IT WHEN THE TEMPERATURE GOES ABOVE 26ºC AND IT PUT THE TEMPERATURE IN 20ºC. IF IN HAWAII YOU HAVE HIGH TEMPERATURES MAKE THIS 3 TIMES A DAY, (THE MAX)! I HOPE IT HELPS YOU! Thanks for the suggestion. I hadn’t thought about DIY homemade air conditioners but it’s a great idea. I leave in SAN Diego by the Beach. And sometimes it does get hot. I recently bought a chinchilla and rescued another ONE from someone who was not taking care of her. My baby Siri is a lovable bundle of joy, the other one is not so Friendly, Alexa it’s taking it’s time, she just sits there and gets afraid of anything and runs away. She is very lethargic and I don’t know what to do… I am being very patient with her, giving her time to adjust to us. Let her out and walk a little around the couch while baby Siri is jumping and running like crazy!! ALEXA JUST MOVES EVERY NOW AND THEN. ANYWAY, I WAS THINKING of the cooling ideas and thought maybe YOU COULD ALSO USE A COOLING PAD ThAT IS FILLED WITH COOLING GEL THAT ARE SOLD AT PETSTORES TO BRING DOWN THE HEAT ON DOGS… I HAVE TWO POMERANIANS THAT NEED THeM BECAUSE THEY ALSO OVERhEAT VErY EASILY AND I HAVE FOUND OUT THIS THINGS REALLY WORK. THERE ARE TWO BRANDS WHICH I HAVE SEEN, ONE IS REALLY EXPENSIVe AROUND 49 DOLLARS AND THE OTHER ONE IS 20 DOLLARS WHICH WORKS JUST AS WELL. THIS PRICES ARE FOR THE LARGE SIZE. I WAS THINKING MAYBE FOR THE CHINCHILLAS USE THE SMALL SIZE… WHAT DO YOU THINK? WOULD THAT BE OK? IT’S NOT EXTREMELY COLD IS JUST FRESH. WHAT DO YOU THINK? AND ALSO IF YOU COULD GIVE ME ANY ADVISE ON ALEXA? WE HAD HER FOR 2.5 WEEKS SO FAR SHE JUST SITS AND BARELY mOVES. HAS SHOWN SOME INTEREST ON THE RUNNING WHEEL BUT SO FAR SHE JUST SMELLS IT. SHE WON’T EVEN TAKE ANY TREATS OR ANYTHING. I KNOW HER PREVIOuS oWNER NEVER GAVE HER HAY, or played with her, HE SAID HE DIDN’T KNOW HE HAD TO….. AND HE ALWAYS KEPT THE DUST BATH 24/7 INSIDE HER CAGE, WHICH IS BAD….. BUT I HAVEN’T SEEN ANY DIscHARGe CROM HER NOSE OR ANYTHyNG AT ALL JUST BEING LETHARGIC…..
Hi. I’d advise against cooling pads. Since chinchillas are so small, it’s not good for them to come into direct contact with surfaces that change their temperature. The best way to keep them cool is to control keep the temperature of their room between 60°F and 75°F. For Alexa, I’d continue being patient and make sure you’re spending about an hour each day sitting by her cage. Let her do her thing but just sit with her so that she gets used to you being by her cage. Keep doing this until she starts to become curious and comes to the side of the cage where you’re sitting. When she does this, you can start putting your hand on the side of the cage and let her sniff your hand so that she gets used to your smell and starts to trust being close to you. Then you can slowly build up to touching and holding her after that. Hi Jenna. Yes a rabbit style water bottle is fine for chinchillas. For the air conditioner and dehumidifier, it depends on the temperature and humidity of the room you keep your chinchilla in. If the temperature goes above 75°F (24°C) regularly in the room, you’ll need an air conditioner. If the humidity goes above 50% regularly in the room, you’ll need a dehumidifier. Fans are no good for chinchillas. Fans work on people because the air evaporates the sweat and has a cooling effect. Chinchillas can’t sweat, so they don’t get this same cooling effect from fans. I use fleece cage liners as bedding for my chinchillas. I don’t usually heat their room because it doesn’t usually get too cold during winter. However, if you live somewhere that gets really cold during winter, you may want to heat their room. I’m not familiar with the signs of coldness in chinchillas, so I can’t answer that question for you. It’s something I need to do more research on, so I’d recommend you do some research to find the answer. I was wondering if using one of those desktop cube air conditioners would be a good idea? I know they run on water and think that would increase the humidity. I keep my house at 73, but when it’s really hot outside my AC unit has a hard time keeping it at that temp so I’m looking at possible solutions to cool a room down just for my future chinchilla. Hi Pamela. I’m not familiar with how effective the desktop air conditioners are. I’d recommend looking at the reviews for the desktop air conditioner you’re considering buying and see if any of the reviews share feedback on how effective they are at cooling a single room. I keep sand in the freezer and give them cool baths when it’s hot. They love iT! Hi Margaret. I’d recommend against doing this in the future. 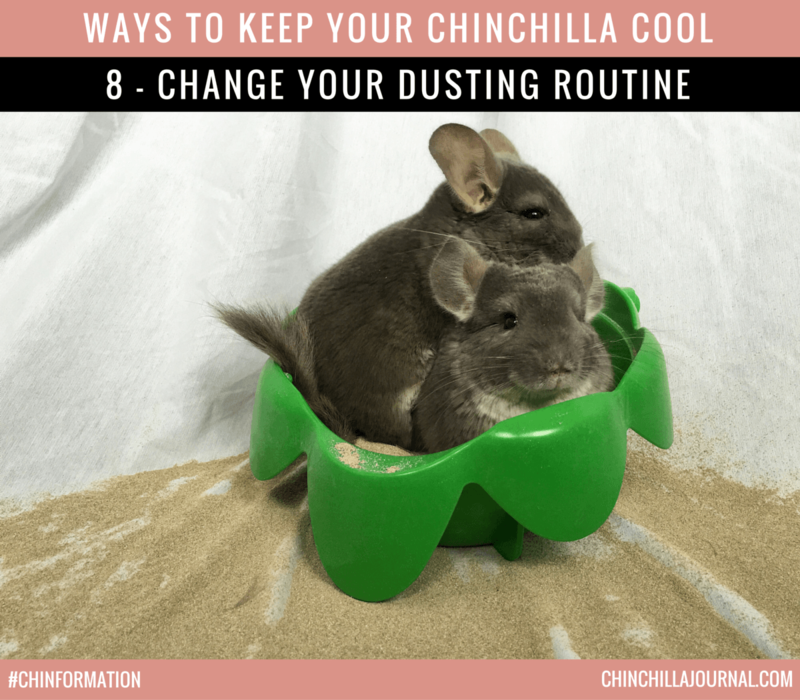 While a lot of sites do recommend cooling chinchilla’s dust in the freezer or placing cool objects in their cage, it’s not a good idea. Coming into direct contact with overly cool objects can have a drastic effect on their body temperature because they’re so small. It’s best to control the temperature of the room to keep them cool in hot weather and avoid giving them cool objects. Hi. The minimum chinchilla cage dimensions are 36 inches high, 24 inches wide, and 18 inches deep. In addition to the cage, you also need at least 48 square inches of open floor space to allow your chinchillas to play freely outside of their cage on a regular basis. Ok. An air conditioner is the best tool for keeping chinchillas cool. When it was very hot this summer my sister suggested putting wet towels over my chinchillas cage. I did this, not covering completely so she could still see out and not feel too enclosed. It reduced the temperature in her cage very effectively. Ok. Thanks for the suggestion. I’m not familiar with this technique but I feel like it may raise the humidity in their cage. It’s best to keep both the temperature and humidity low for them. The chinchilla/rodent community should commission a company like HYDROFLASK to consider constructing water bottles for pets. Keep ice cold water for our chins a lot longer. Yes. I think there are insulated small pet bottles available but I’m not familiar with any of the brands.